Okay, it seems that people in Philadelphia do it too. 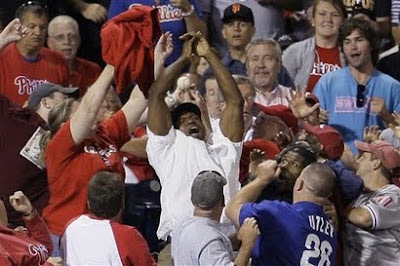 I'll just go with the assertion that this guy is NOT a Phillies phan, as I don't see any identifiable garment tying him to the HOME TEAM. The moral of these "Eyes Closed" posts is that fans in attendance at baseball games do no catch homerun balls with their eyes closed. That even applies to the above Ninja Turtle Michaelangelo look-alike, when he attends Phillies games. Turtle Power, my man! It seems as though The Shore Sports Report fantasy football league, that drafts tonight, has a few spots left open. It's a free ESPN league, so check it out here, if you are interested. Crashburn Alley's got a look at the Phillies' weak offense as of late. Find that here. Homeside News is a very good blog that follows current and former Phillies prospects. Have a look by clicking this link. More Hardball talks about the possibility of Curt Schilling in politics and discusses another former Phillie in politics, the great Jim Bunning. Check it out here. Follow PhoulBallz.com on Twitter for stats, updates and trivia HERE! wow man....that guy actually does look like the TMNT Turtle. Nice find! Yeah. I am craving pizza now.